CT talks with Penn State University Director of Education Technology Kyle Bowen about "experience labs", such as the university's Immersive Experiences Lab [photo, below]. Older computer labs can be transformed to support engaging, targeted learning experiences based on innovative technology and design choices. Often, the computers are no longer necessary! Mary Grush: Why are you changing your ideas about computer laboratory spaces? 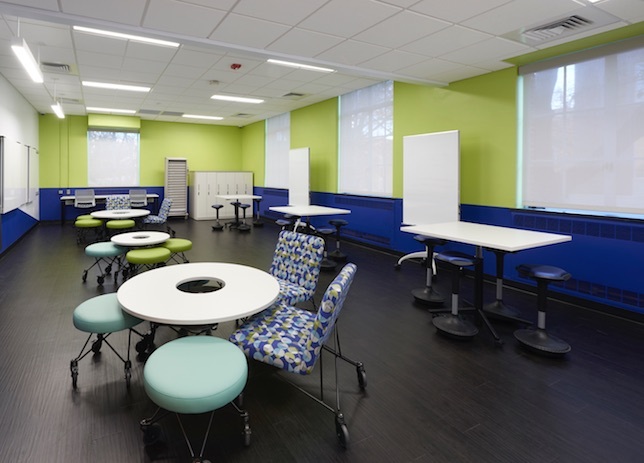 Kyle Bowen: Historically, we've talked about learning spaces from the perspective of classrooms, but of course, we do have other kinds of spaces. You may immediately think about the computer lab — a familiar kind of place. But it's time to challenge assumptions about what these labs really are, why we use them, and what they could become. We can start to do more interesting things with these spaces, things that complement coursework in even greater ways than traditional labs have. Grush: How do you begin to change your thinking about computer labs on campus? Bowen: The computer lab is a generations-old model, based on an idealized solution, where for every one student, there is one computer. These were places where you went to work on a desktop computer or workstation. It's important for us to revise and update our understanding of labs, and to introduce more diversity into our thinking about them. Universities, schools, and departments should think more deeply about how they are using their lab stations. They should consider taking these resources in new directions and imagine how they can provide students with wholly new learning experiences in the lab spaces. Grush: How did you approach this question at Penn State? Bowen: We found that the key to innovating our use of computer labs was to not to think about them as laboratory spaces, but to begin thinking of them as learning experiences. Grush: What would such a learning experience include? Bowen: An experience has three parts to it, in terms of the laboratory: the environment (the room itself); technology and furnishings (this might be digital technology, furniture, or any relevant learning materials needed); and expertise (guidance from people). Note that computers, per se, are not necessarily required! The target experience itself will dictate how the lab is designed, not the presumption that we must have rows and columns of computer workstations. In many cases, we are replacing the old computers with a range of alternatives from prototyping tools to whiteboards. And we are seeing opportunities for virtualization and mobile technologies — as students become more accustomed to the practice of BYOD. It's also important to stress the presence of expertise. The room may include guidance, from faculty, a lab assistant, peer counselors, or tutors… Generally, in order to get the most from an experience lab space, having people there who are experts or well-versed in the particular discipline or task at hand is an asset that's unique to this type of lab. Experience guides are an important part of the lab. Grush: You are talking about changing the institution's notion of lab space. What do students expect labs to be? Bowen: In terms of what students come to labs for, they might think of being able to work with other students, or to get access to technology or specialized software, or even just to use available power… So their lists of needs are somewhat personal. Grush: Yes, I remember that a comfortable chair was big on my list! Bowen: Right! It's striking, that when you look at these personal lists, nowadays, not many of the reasons for coming to a lab really require a laboratory computer! Grush: So we are approaching the days of the computerless computer lab? Bowen: Yes, in a way, but remember, this comes from trying to challenge our assumptions about labs — to update our ideas about these learning spaces, so we can do new things. We are making new, experience labs. Grush: What about the scheduled or drop-in use of labs… or "experience labs", as you call them? Bowen: Of course scheduling practices can change, too. Rather than holding classes regularly in a lab space, that space can be used "on-demand". Drop-in lab spaces can often be much more efficient, serving greater numbers of classes in total. Of course, having labs available for drop-in use is not a new concept, but pairing that with the notion of "experience labs" — and having expert guidance available to help students complete targeted or specific experiences — should, in the end allow us to get much more value from the dedicated space. Grush: You've already started up some experience labs at Penn State. Could you cite a couple examples? Bowen: Sure. We have a Maker Commons that we've developed here at Penn State. We've moved a bit away from what you might call a traditional makerspace (yes, maker technology has been around long enough to use the word "traditional" here). So rather than having many, diverse tools available in the space, we have selected a discrete set of rather specific technologies. That specific focus is different than the more generalized service you'd normally expect from a makerspace, but, we have worked with our faculty to design course elements that correspond to the tools in our space. We also have invested in having a maker-in-residence who is on hand to help students complete their projects. Given these strategies, students end up with a richer understanding of what they have done in the lab. The space becomes less of a service center and more of a learning experience. A bit more recently, we created a new experience lab: our Design Experiences Lab, where students explore design thinking or user-centered design approaches. The lab was created around the question, "How do we provide the most desirable space for students to engage in these semi-structured design experiences together, on a drop-in or ad-hoc basis?" In a moment when the lab is not in use, you can see how it's laid out [photo, below]. Grush: So it's considered a collaborative space for small groups? Grush: Is the room flexible, to accommodate an entire class if desired? Bowen: Yes, instructors can either bring their classes or groups in, or send them over — we have experts in design thinking who can facilitate a discussion among students. So you can see, the lab staffing is an important element of an experience lab: We build in on-site guidance on specific topics relevant to the experience lab and beneficial to student learning. Grush: How do you make sure you are not serving only a smaller proportion of the student population with experience labs? Bowen: As we think about different kinds of spaces and different kinds of collaboration and lab use, of course we find the need for different tools in different spaces. And certain spaces tend to serve particular needs. But, our goal in IT is to begin to engage more students in using the labs, overall. We want all our students to learn from the experience labs. The question becomes, how do we engage not hundreds, but thousands of students? What we learned was, if we design many, multiple smaller spaces around campus, we can have more engagement overall. By having more types of labs that serve more types of disciplines and courses in different schools and departments across campus, we have more impact. Grush: Does it increase costs to operate so many experience labs? Bowen: No, because we are targeting the technologies placed in the labs according to each lab's purpose. And there are more available smaller rooms (less than a thousand square feet) on campus — so using those already-available spaces is usually less expensive than constructing larger collaborative centers. Bowen: Of course. These labs are no longer square boxes in which you seat up to a certain number of people. We have to create the right space: For any given lab, we ask: How do we grow a space that will help achieve the specific learning outcome that our faculty are looking to achieve? Bowen: That, too. We have to create these labs in such a way that we are helping, not causing a burden, for faculty. We have to provide support, both in the lab and for the faculty as they plan to integrate the lab into their courses — as they engage their students with new kinds of assignments. Grush: What organization on campus is responsible for all these labs? Does all this happen through the media center, or through the library… or even through IT? Bowen: Actually, IT is a good home for this, and experience labs provide an opportunity for IT departments to lead their campus in the thoughtful application of technology. And who better than IT to think about how to scale these labs? Of course, many institutions already have groups that support computer labs. And they have people who not only provide support in the labs, but also work with faculty to get value from these spaces. For us, at Penn State, IT is the home for experience labs, and we have the creativity and drive to approach this responsibility. Our first, overriding questions are: How do we diversify the notion of a lab? How do we create many wonderful experience labs and help people to use them? That's where our priorities lie. From there, we can better approach issues like scheduling and administration. We welcome seeing these labs well-used and productive!